Do you love fruit, and do you find yourself wanting to share it with your dog? Some fruits are perfectly fine to offer your dog, but figs require a little more caution. While figs for dogs are generally regarded as being safe, they can cause some side effects for which you should watch. Plus, fig trees themselves could put your dog's health at risk. Figs offer a number of nutritional benefits to dogs, and many dog owners opt to feed these fruits to their pets. According to Organic Facts, figs contain lots of potassium, which can help dogs keep their blood pressure down. If you're trying to get your dog to lose weight, figs for dogs can help. These fruits are filling, and just one or two figs can keep your dog's hunger at bay. Figs also contain fiber, which is particularly good for dogs who have a weakened colon, are dealing with weight issues, or are at risk for diabetes. Figs aren't without their risks either. Some dogs are particularly sensitive to these fruits and may experience unpleasant side effects after consuming them. Organic Facts states that figs contain two enzymes called ficin and ficusin. These enzymes can be too strong for your dog's stomach to handle. Dogs who eat more than a few figs at a time often have an upset stomach along with diarrhea or vomiting. Some dogs may develop rashes, sores, or inflammation on their mouths and tongues. If your dog experiences any of these symptoms, discontinue feeding figs immediately. You will also need to closely monitor your dog to make sure that the symptoms don't get worse. While you may be able to treat mild symptoms at home, rashes and inflammation can progress to a serious allergic reaction that threatens your pet's health. Be prepared to seek immediate emergency veterinary treatment if your dog's condition worsens. In addition to the side effects your dog may experience from eating figs, there's another danger associated with fig trees of which you should be aware. According to the American Society for the Prevention of Cruelty to Animals, the fig plant is toxic not only to dogs but also to cats and horses. Ingesting any part of the fig plant can lead to a serious, life-threatening toxicity in dogs. According to Wag!, fig plant leaves contain a sap that is very irritating to dogs whether it gets on their skin or is ingested. When a dog eats any part of a fig plant, the dog may suffer fig poisoning. This often happens because many homes keep fig plants indoors and don't realize the risk these plants can pose to dogs. If your dog consumes part of a fig plant, you may notice a variety of symptoms. Wag! states that your dog may drool, experience diarrhea, or vomit. She may suffer from abdominal pain. Fig plants can also affect the skin around your dog's mouth, so she may rub at her face in distress, develop irritated skin, and have watery eyes. Fig poisoning is a serious health issue and needs to be treated as an emergency. Even if your dog is only displaying mild symptoms, you need to take her to the vet for evaluation and treatment. If you know that your dog ingested a fig plant, be sure to tell this to your vet. According to PetMD, if the cause of your dog's poisoning is unknown, then your vet will treat your dog according to his symptoms. Your vet may also order blood work to determine the exact cause of your dog's poisoning. Wag! states that if you saw your dog consume the plant, try to take part of the plant to the vet with you. The plant sample will help your vet to confirm the cause of the poisoning, and the sooner that the cause is confirmed, the sooner your vet can start treating your dog. If you have a sense of how much of the plant your dog ate, this is also important information to provide to your vet. Prompt treatment can help to minimize the effects of the poisoning and will get your dog feeling better again sooner. Your vet may use a variety of strategies to treat your dog's fig poisoning. According to Wag!, if your dog hasn't yet vomited up the sap, your vet may help your dog vomit so that the toxins are no longer in her belly. Next, your vet will probably give your dog activated charcoal, which will stop your dog's body from absorbing any remaining toxins. Your dog will probably have residual sap in and around her mouth, so your vet may give your dog a bath to help keep the sap from causing any further irritation. Your vet will carefully examine your dog's eyes, and if there is sap in or near them, he will perform an eye wash. A topical ointment can help to treat any irritated areas of skin. Additionally, your vet will probably administer intravenous fluids to your dog. These fluids will help to keep your dog hydrated while simultaneously supporting urination and kidney function. As mentioned earlier, figs for dogs aren't necessarily a bad thing, and figs can have some valuable nutrition benefits. Fig trees, though, are highly dangerous. The decision of whether or not to feed your dog figs is one that only you can make, though you should definitely discuss any dietary changes with your vet prior to making them. Organic Facts suggests that if you decide to feed your dog figs, you should do so carefully and with just small bits, especially when it's your dog's first time eating this fruit. Give your dog just a small piece of fig and then monitor him for any signs of digestive upset or skin irritation. You can gradually work up to feeding your dog multiple pieces of fig, but always feed figs in moderation. In order to keep your dog safe, never keep fig trees in your home. These trees are toxic, and even if you carefully guard them to keep your dog away from them, accidents can still happen. Instead, purchase figs or keep fig trees outdoors in a secure fenced area that your dog cannot access. If you decide not to feed your dog figs, that doesn't mean you can't feed your dog fruit. Many fruits are good for dogs, and they can offer some variety and extra nutrition to your dog. The American Kennel Club states that apples without the seeds or core, bananas, blueberries, cranberries, mangoes, oranges without the peel, raspberries, and strawberries are all fine and nutritious for dogs. When introducing fruit to your dog's diet, do so slowly and in moderation. Sudden changes to your dog's diet can cause digestive upset, so only offer small bits of fruit and then gradually increase the amount that you feed your dog. If you have any questions about your dog's nutrition or diet, ask your vet for advice specific to your dog's age, breed, weight, health, and health history. 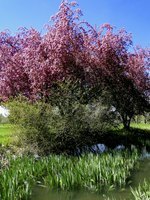 Is a Crabapple Tree Poisonous to Dogs?